You too can wear Luke Skywalker's signature Bespin battle fatigues! From Star Wars: Episode V - The Empire Strikes Back. 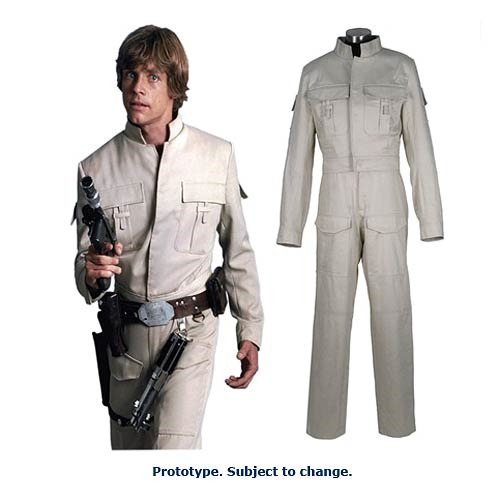 The main costume of our hero in Star Wars: Episode V - The Empire Strikes Back, Star Wars Luke Skywalker Bespin Battle Fatigues is a uniform piece Anovos is proud to offer. Extensive measurements, digital Pantone color samples, and physical patterns were taken directly off the original screen-used outfit, one of the few costumes from the movie still residing in archives. Every detail possible has been recreated, from the convex bends of the lapels to stitch-for-stitch specific collar detailing. These details and more come together to create the most accurate replica of a Luke Skywalker's Bespin fatigues ever offered by a licensed entity!